We’re now well into the 2018 NCAA football season, and some of the nation’s best are sifting to the top of their respective positions. With our proprietary grading of every player on every play of every game at the FBS level, we’re in a unique position to be able to highlight not only those players who dominated on a weekly basis but also those who have now shown up for their teams week in and week out. This list of best players at every position is brought to you by Eckrich, the Official Smoked Sausage of the College Football Playoff. 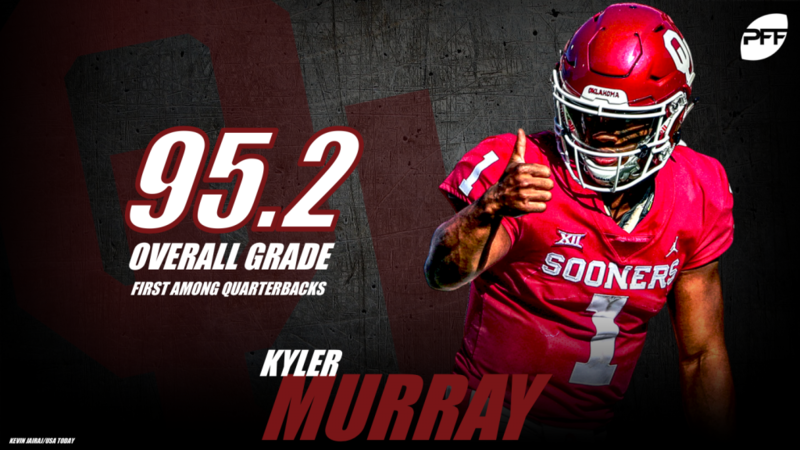 Murray has been incredibly efficient this season, ranking first in percentage of positively-graded throws while tying for 16th in avoiding negatively-graded throws. He currently has the top passing grade in the nation at 93.9, but also the top grade as a runner at 88.7. The video-game-like season continues for Henderson, who is now averaging 9.5 yards per carry (1,280 yards on 135 carries) and a gaudy 6.6 yards after contact per rush. 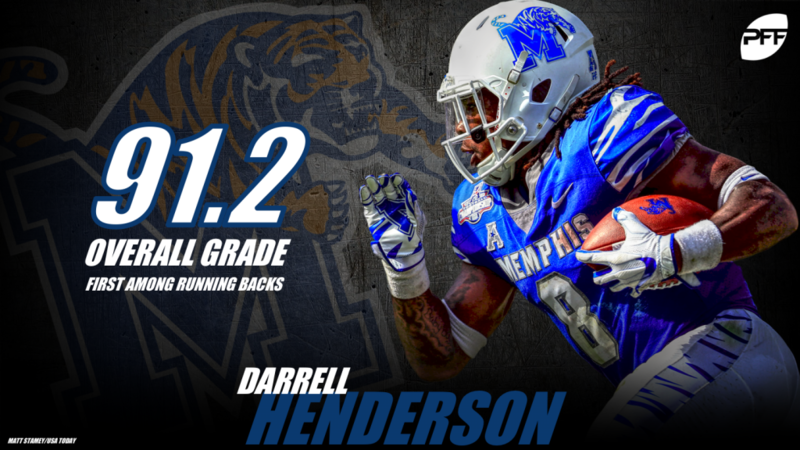 Henderson ranks seventh in both rushing grade (88.9) and receiving grade (86.9), and he’s averaging a ridiculous 18.9 yards/reception in the passing game. Isabella’s 1,391 receiving yards are more than 200 more than the next-closest receiver, and he’s doing incredible damage with the ball in his hands, leading the nation with 620 yards after the catch. (8.3 YAC/reception). He’s forced 13 missed tackles on his 75 receptions, and his 58 first downs or touchdowns leads the nation by seven over the next-closest receiver. Brown has the nation’s top receiving grade at 90.6, and he leads all tight ends with 321 yards after the catch (8.4 YAC/reception). 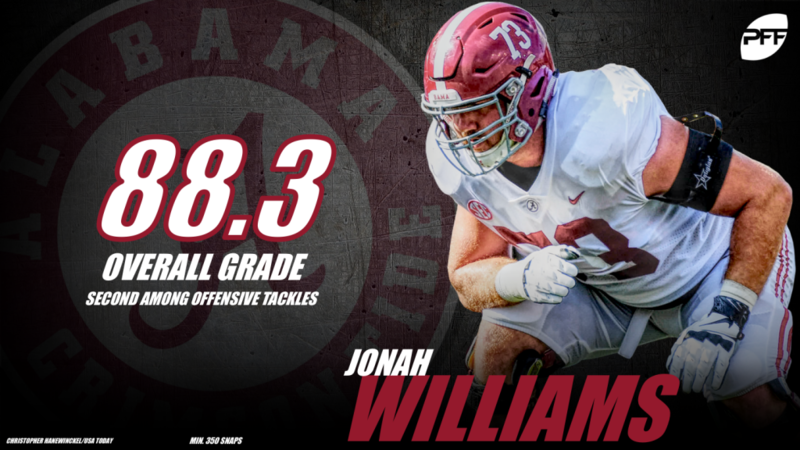 He’s forced 20 missed tackles after the catch, 12 more than the next-closest tight end and he’s also been graded well as a run-blocker, ranking 10th at 70.7. It’s been a tight battle between two preseason top-15 players in Williams and Kansas State’s Dalton Risner, but Williams currently has the lead as he ranks 13th in the nation as a pass-blocker at 87.2 and first as a run blocker at 83.0. He’s allowed only five pressures on 271 attempts this season. Prescod has been dominant in the run game and owns the nation’s top mark run-blocking grade at 89.8. He’s also been strong in pass protection, allowing only five pressures on 242 attempts. O’Hagan has the nation’s ninth-highest grade as a pass-blocker, allowing only three pressures on 332 attempts, and he ranks first as a run-blocker at 85.2. 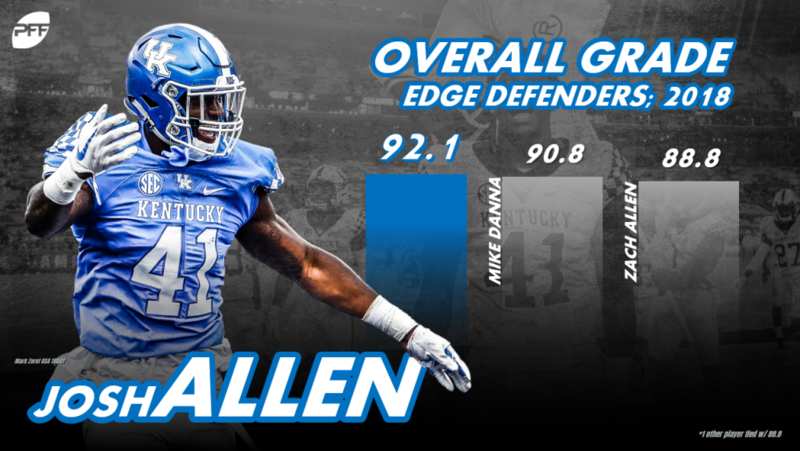 No defender has made an all-around impact like Allen, who is tied for eighth in the nation with 41 pressures despite only tallying 194 rushes. He has 10 sacks, seven hits, and 24 hurries this season, all leading to the top pass-rushing grade of 93.8. Allen has also been stout against the run, with an 85.4 run defense grade and he’s dropped into coverage on 106 snaps, breaking up three passes. 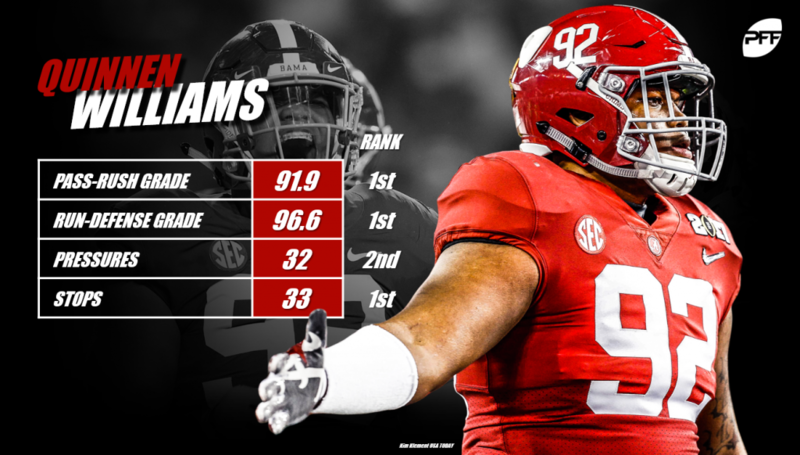 The best defensive player in the nation this season, Williams is on pace for the best season by an interior defensive lineman in our five years of grading. He has the number one grade in the nation as a pass-rusher (91.9) and the top mark against the run (96.6). Williams ranks second in the nation with 32 pressures (six sacks, 12 hits, 14 hurries) and also he’s first with 33 defensive stops. One of the unsung players in the nation this season, Woodward ranks fourth among linebackers with a 92.4 grade against the run and fourth in coverage at 90.5. He’s broken up three passes, picked one off, and he’s only missed two tackles on the year. 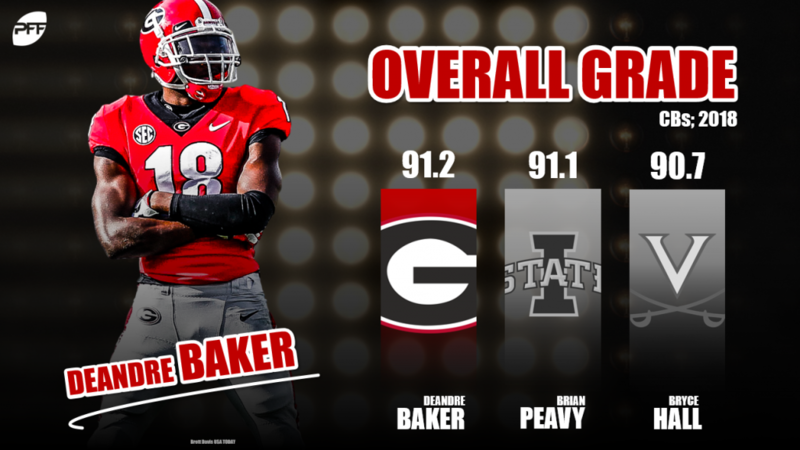 Consistently ranked as the top cornerback in the nation, Baker has allowed only 132 yards on 32 targets to go with eight pass breakups and two interceptions. He has allowed a passer rating of just 34.9 into his coverage, sixth-best among corners with at least 30 targets. Thompson has been making plays since Week 1, tying for the national lead with six pass breakups to go with two interceptions. His 91.5 coverage grade is tops in the country, and he’s been solid in the run game with an 82.9 grade.